If you’ve ever tried to give directions to someone when you aren’t that good at it, or maybe aren’t entirely sure where you are let alone how to get there, you know how frustrating of an experience that can be. Fortunately you can avoid that situation entirely now though thanks to a great location sharing feature on the iPhone, which lets you send your current location on a map immediately to someone else. 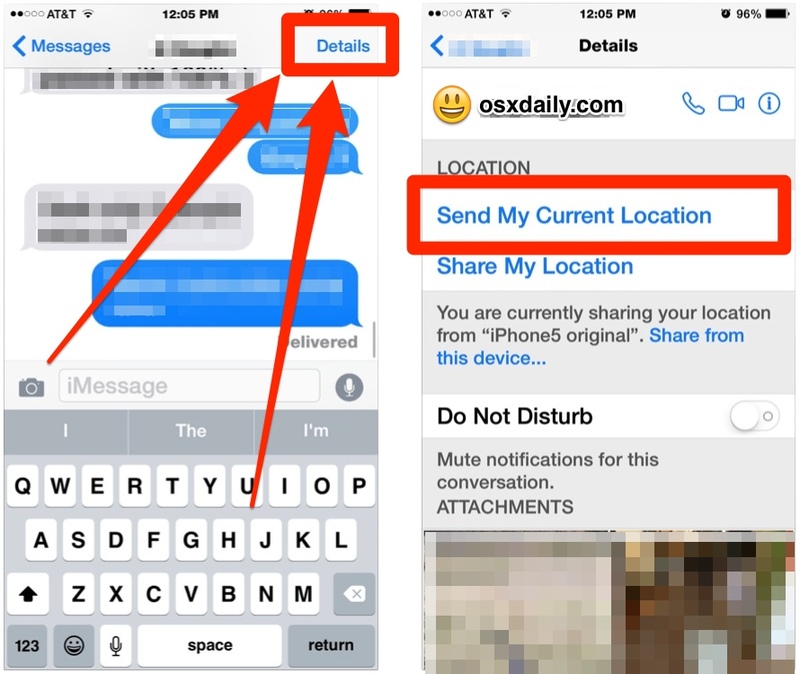 The recipient can then route directions exactly to your location, or at least locate you on a map and know where you and your iPhone are located. This feature allows sharing of a current location, it works best on the iPhone thanks to the devices built-in GPS unit, though it will also work on an iPad and iPod touch, though it uses a rougher estimation through wi-fi instead. Note that in this screenshot example, the map hasn’t finished loading, but when you actually send a location this way the map will appear loaded in the messages app with a pin noting the location and/or address. 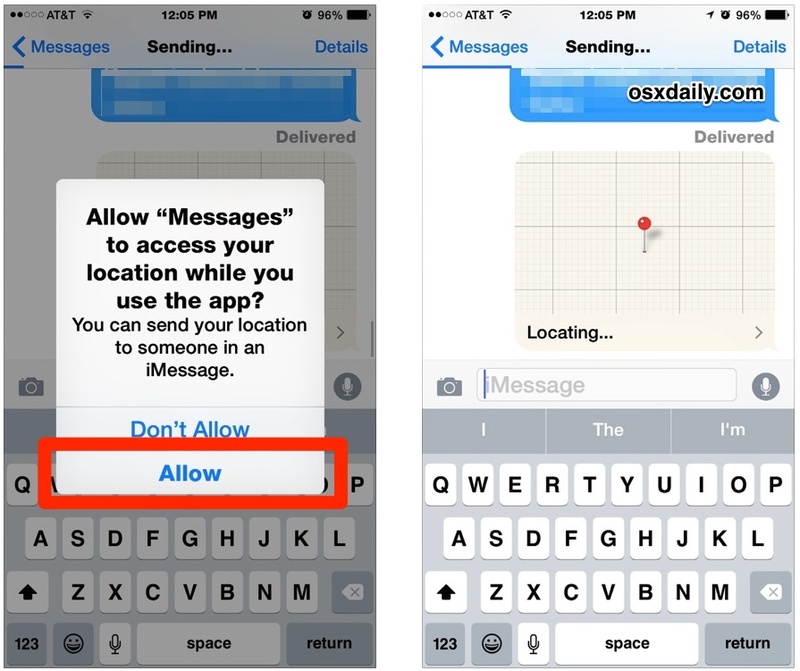 On the receiving end, a user with iMessages and iOS 8.0 or newer will instantly see a map with the location, which can then be tapped onto for further options, like getting directions to that location. If the recipient has another version of iOS or Android, a standard link to open your location in a maps application for will be available instead. This is one of those features that really comes in handy once you remember that it’s there, whether you’re trying to give someone directions to an unfamiliar location, or even just want to share with someone where you are currently located. You can even use this to send a location to yourself as a way of marking a location on a map that you may need in the future, like finding your parked car in a large lot or an unfamiliar city, though the map pinning trick works well for that too. For users who are not on a modern version of iOS, you can also send a current location through another Maps application like from Apple Maps or Google Maps, and those coordinates can be sent through messages or email. Nonetheless, this is much faster if you’re already in the Messages app. It’s also worth mentioning that Mac users can share location in a similar manner from the Maps app, and you can also share any location pinpointed on a map that way, right from Mac OS X. You do not need to feel “stupid” for asking these questions, I understand if you’re have never used an iPhone before. I remember my first time too, Dainius. Just ease into it and don’t stress out, don’t over think it, you don’t want to get anxiety about the first time you use an iPhone. Don’t worry if you mess up, you’ll get better over time. Great post and a reminder of a feature that I didn’t know, or forget. New to me! Thank you! I enjoyed your reply Papa G, being subtle can be a very good thing…tongue in cheek so to say. I use my iPhone as my navigator often when driving. Siri is such a dear. I like and agreed with Papa Gs answer to Dainius! Does this work with someone that is still on iOS 7 from an iPhone with iOS 8? @Icebox, yes it sure does. That’s what they meant in this statement although it wasn’t exactly clear: “If the recipient has another version of iOS or Android, a standard link to open your location in a maps application will be available instead.” The same applies to videos and voice messages sent through the new iOS 8 messages app. Receivers with older versions of iOS still get the messages but instead of viewing or hearing them within the messages app, when they click on the message it takes them out to a different app to view or hear. Apple took a clunky 2 step process and made a more elegant 1 step process on the sending and receiving end. What a useless feature – the government already KNOWS where you are and the rest of us don’t care. But wait – maybe we could get Jihad John and the rest of his ISIS buddies to turn this feature on; it would make it that much easier for the drones to find them. This is not a useless feature, it’s quite useful actually. The feature is for sharing your location with friends, family, or colleagues, who may not have your location but would like to get there. Say you’re at a birthday party and want to invite your cousin over who has never been to that house in the middle of nowhere, etc. Or you’re at a coffee shop and a friend has not been there before but wants to meet you, so you want to give them easy directions. On a related subject, my question is if I receive a location and click on it does the sender see my location? I received a message with a location and before clicked before thinking about it. I don’t know this person. I believe he may be fictitious. I have the latest software. I’m on an iPhone 5. I don’t show “details” on my iMessages. How do I send messages? How do I delete these recipient location messages from my text? When I choose it to delete the little trash can icon fades to where it’s not available.